Every week we will feature a foot-stompin, ear-pleasin' band, a family-style, from-the-land meal, and farming inspired activities to welcome you and your kiddos into our farm life. We will take inspiration from the season and our surroundings to shape each event. Check out our what we've got in store and get excited! KeruBo is a performing Afro-Jazz artist, originally from Kenya who is now a Vermonter, living in the Burlington area with her family. She has more than 20 years’ experience performing all over the world in music festivals as a singer and dancer. Her style of music is a blend of African Traditional Music, with inflections of Brazilian Samba/Bossanova, Jazz, and Blues. KeruBo sings African folk music and Afro jazz, from slave spirituals, African laments, civil rights songs, story songs, gospel songs, and beyond... Her influences are from generations of music artists and songwriters but more particularly – Achien’g Abura, Miriam Makeba, Dorothy Masuka and Nina Simon. She feels that these notable, strong-minded, female singers effectively used their music as a powerful medium for bringing awareness and rebuking social injustices. They told human truths as they saw it without worrying about consequences. KeruBo’s music is about preserving her culture and heritage, while highlighting social issues affecting vulnerable minority groups such as women and children. "Chaque Fois!" 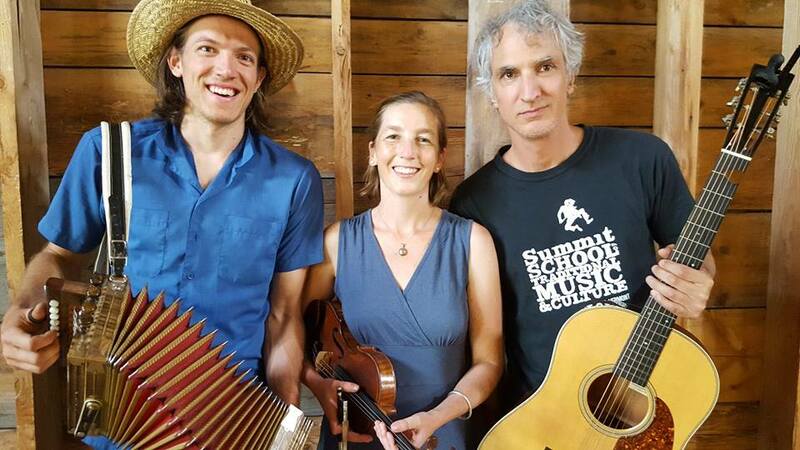 performs Cajun music, from southwest Louisiana, that sets a festive atmosphere. The name translates to "every time," and represents the fun and energy the group generates whenever they play together. The band is led by Alec Ellsworth (accordion, fiddle, vocals) and Katie Trautz (fiddle, vocals). Both multi-instrumentalists, they weave rhythms, harmonies and melodies together with their instruments and voices. They are joined by Chris Hollis on guitar and triangle, and Helen Doyle on Bass. Mister Chris & Friends is a musical project focused on the simple beauty of childhood, parenthood, and community. Singer-songwriter and educator, Chris Dorman, writes, records, and performs thoughtful and tender songs that captivate mutli-generational audiences. Chris is joined by Ethan Tischler, Caleb Bronz, Tyler Bolles, and revolving surprise guests for each performance. The band performs original songs with the most sensitive ears in mind. These songs are also the foundation for Chris's music and movement program, Music For Sprouts, as well as a new children’s television show called Mister Chris & Friends, created by Chris and produced by Vermont PBS. Rebecca Levi is a singer-songwriter and performer of South American folk music. Originally from New York City, she has lived for years in Peru and Colombia, teaching music and exploring the vast diversity of rhythms and tunes along the spine of the Andean cordillera. With her band Debarro, Rebecca arranges traditional South American pieces for contemporary audiences. In her original songs, she combines the sounds of North American folk music with a Southern sensibility. ALL TICKETS PURCHASED FOR AUGUST 17th BURGER NIGHT WILL BE HONORED ON AUGUST 24TH. Weather: We will not cancel due to inclement weather. Unless there is torrential rain or thunder/lightening, we will run the event. Each event will have an inclement weather date of the following Friday for those extreme weather events. Refunds: We will not offer any refunds for BN tickets purchased, if we need to use the inclement weather date, we will also not offer refunds. Please understand this policy when you purchase your ticket. Join us for a night of folk, country, and honky tonk! Eric George is a songster and entertainer who helps keep the American folk tradition alive. From early country and delta blues to original songwriting, his repertoire is remarkably extensive and diverse. With a voice that drifts between dirt and clouds, he is able to entertain folks of any age and background, singing with roots dug deep.